Left to right: Commencement Speaker Hon. Harry A. Blackmun, Associate Justice, U.S. Supreme Court; Hon. 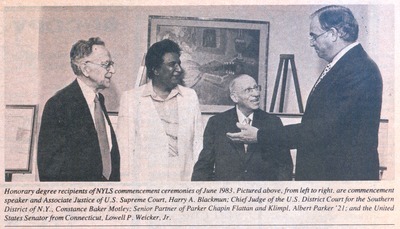 Constance Baker Motley, Chief Judge, U.S. District Court for the Southern District of N.Y.; Albert Parker '21, Senior Partner, Parker Chapin Flattau & Klimpl; United States Senator Lowell P. Weicker, Jr. (CT).